Friday nights during the summer are especially magical because of the pool party sponsored by the Elks Pool! If you haven’t been to the Elks you are really missing out! The City of Boulder [and surrounding towns] offer beautiful facilities that are well kept and I appreciate them. 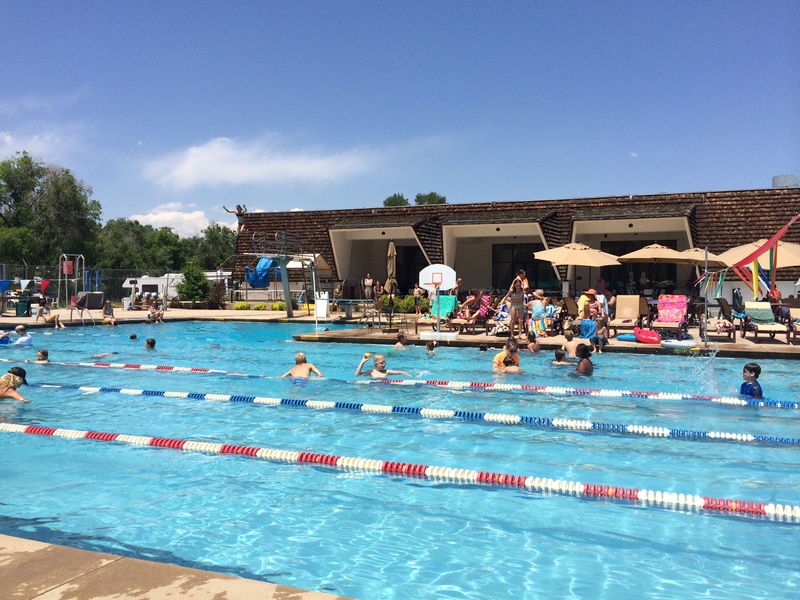 But the Elks offers a down to earth pool in their 70’s style space with a high dive and a low dive, kids playing and having fun, and their Friday Night Family-Friendly Pool Parties – after 5. These Friday Night Family-Friendly Pool Parties are great for the whole gang, free, & they cook up a b.b.q. so you don’t really need to worry about bringing the food – it’s sort of heaven! So bring a blanket, some sun screen, your towel and get ready for a great night! Elks Pool – located on the West side of 28th Avenue, North of Iris and South of Jay Rd. We live in Boulder so most of us get out kids outside on a regular basis. 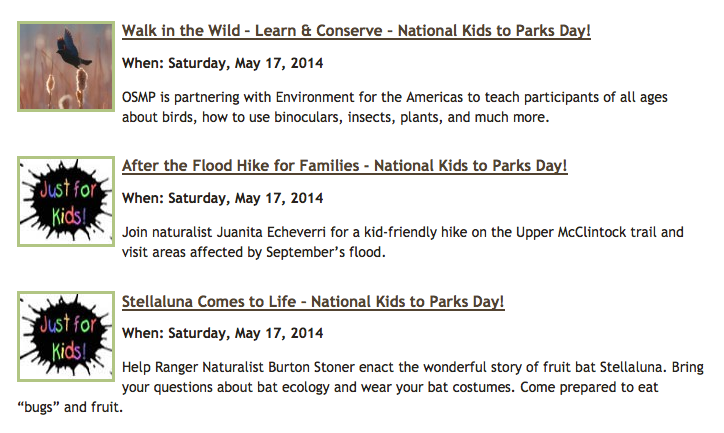 But hey, May 17, 2014 is a National Kids to Park Day. So lets get outside and help support a great national effort to get outdoors more! Maybe think about heading to a park you have not been to. Or doing something you have not done. Or just making the time to go together as a family. Whatever your reason here are some ideas of where to go. what to do, and why do it. The National Park Trust is asking people to pledge to get to a park on National Kids to Park Day: Take The Pledge Here! Getting outdoors benefits the body, mind & spirit! When you are outdoors at a park you are moving your body and getting exercise, taking in some vitamin D, laughing, and enjoying time together. There is research showing that being outdoors can do everything from reducing ADHD symptoms, increasing test scores, etc… [You can find more details here at the National Wildlife Federation’s website] But we know that being outside just increases our overall wellbeing. Get outside. You will get something from the experience! There is always something to do at your local park or on a hike. Think about bringing a picnic and making sure you gage what you do to ensure your children have fun out there. 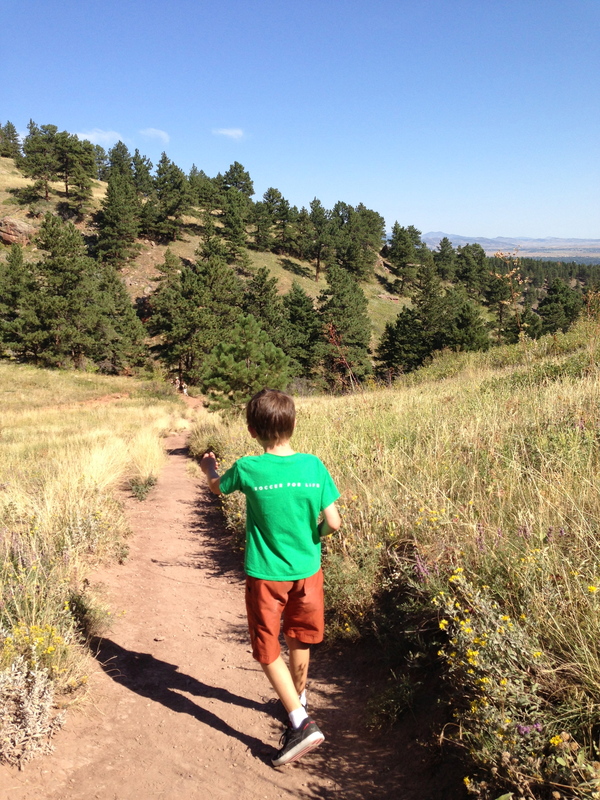 There are a few things the City of Boulder’s Open Space & Mountain Parks is planning for National Kids to Parks Day on May 17, 2014, which sound really fun for the whole family! More details here. What are you going to do for National Kids to Parks Day? Family-Friendly Boulder area events for the next week are right here! NoBo Corner Library Open House. Check out this great spot 4 to 7pm. CU Wizards: Water, Water Everywhere. FREE Night at the Denver Firefighter Museum. 4 to 6pm. FREE Day at the Denver Museum of Nature and Science. Cruisers and Crawlers. Children 9 to 24 months are welcome to enjoy a storytime. 10:15am at the Main Boulder Library. Bilingual Spanish/English Storytime at the Main Boulder Library. Storytime in both English & French. 10:15am at the Main Boulder Library. FREE Evening at the Denver Children’s Museum. Free from 4 to 8pm. Pearl Street Stampedes are fun for the whole family. Come out and cheer on the CU Buffs, listen to band music, and get merry. Starts at 7pm in from of the Boulder County Court House. CU vs So. California. Always free. Nature for Kids & Parents: Gobble, Gobble. Learn terrific facts about wild turkeys and why they are different from domesticated turkeys! Games and nature activities on this easy hike. Kids ages 5+. 1pm at the Chautauqua Ranger Cottage. Panicking Poultry Turkey Trot at the Boulder Reservoir. 5 mile, family-friendly run. 1 mile kids’ run. Boulder Folders. Informal origami workshops for people aged 10 and older or experienced younger folders accompanied by an adult. Please bring your own paper if you have it. 10:15am @ the Main Boulder Library AND 1pm @ George Reynolds Branch Library. Boulder Farmer’s Market. Meet your farmers, do some artwork, get some lunch. There is always so much going on at the market! 8:00am to 2:00pm. It’s still open. Head out to support these great farmers, bakers, and the rest! Switch on the Lights. Head to Downtown Boulder for a holiday performance by the Boulder Chorale as Santa counts down to the grand illumination of the Boulder County Courthouse and the Pearl Street Mall. 1300 Block of Pearl Street. 5pm. Stick around for FREE visits with Santa until 7:00 p.m.
Storytime Creek Walk: Packing It In For The Winter. Families can join the Boulder Public Library for story and activities including an outdoor explore along Boulder Creek. Dress for the weather. 10:15am at the Main Boulder Library. Boulder Folders. Informal origami workshops for people aged 10 and older or experienced younger folders accompanied by an adult. Please bring your own paper if you have it. 1pm @ George Reynolds Branch Library. Find a listing of fun family-friendly events and happenings around Boulder right here each Friday! The Liquid Crystal Wizard’s Show. A great CU program teaching kids the love and magic of science! These are free presentations that are always fun. Aimed at kids 5th grade and up, but all welcome! CU’s Duane G1B30 at 9:30am. Dance Bridge Showcase. Fun, free, family dance showcase! Boulder’s annual “Dance is for Every Body!” showcase is a rich harvest of regional dance. Equal parts entertainment and education, the showcases feature local dance groups participating in 5 – 15 minute, family-friendly presentations. The one hour showcase is FREE and open to the public. 3:00pm at the Meadows Branch Library. 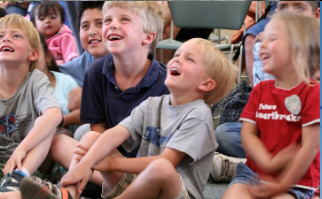 Bilingual Spanish/English Storytime at the Main Boulder Library. Disfrute con sus hijos cuentos, rimas y canciones del segundo, cuarto y (cuando sea aplicable) del quinto sábado del mes. Enjoy stories, rhymes and songs with your children in English and Spanish. 10:15am at the Main Boulder Library. BVSD Day Off. What are you planning? A day at the Valmont Bike Park? A hike? Time with friends? An art project? Science Discovery Teen Cafe: Extreme Weather. Teen Science Café is a free, fun way for teens to explore the latest ideas in science and technology. Stimulating conversations with scientists, engineers, and inventors take place in an informal and relaxed setting. Free food is served! 6:00 to 7:30pm. RSVP at the link above. Jeepers Creepers–Halloween Fun In Nature! Explore the mysterious worlds of our favorite Open Space and Mountain Parks Halloween creatures, the bat, the bear, the owl and lion. Naturalists will lead you on a short hike around a wild neighborhood from den to roost and perch, where we will share a moment with these costumed creatures of the night. Join in your own costume, with a flashlight for this short hike. You have to register for 1 of 3 hikes. 5:30pm, 6:00pm, or 6:30pm. Location provided with registration. Ages 6 and up. Halloween Carnival at the South Boulder Recreation Center. Jumpy house, games, activities, etc. Kids 2-8 y.o. can join in this fun annual event. 3:00 to 5:00pm. Cost is $5. Pearl Street Stampedes are fun for the whole family. Come out and cheer on the CU Buffs, listen to band music, and get merry. Starts at 7pm in from of the Boulder County Court House. CU vs Arizona. Free. Super Science Saturday at NCAR. People look forward to this event all year long! Be entertained all day with weather balloon launches, science experiments, amazing activity tables, and engaging activities for the whole family. In one of the most amazing locations ever. Free event. All ages. 10:00am to 4:00pm. Ghost Walk, Ghost Talk. Learn about the haunted happenings in the historic homes on north Mapleton Hill. This is a family-friendly spooky event. Children $8 [5 and under free] 5:30 to 9:00pm. Purchase tickets ahead of time. Wild Bear Mountain Ecology Center’s Enchanted Forest. 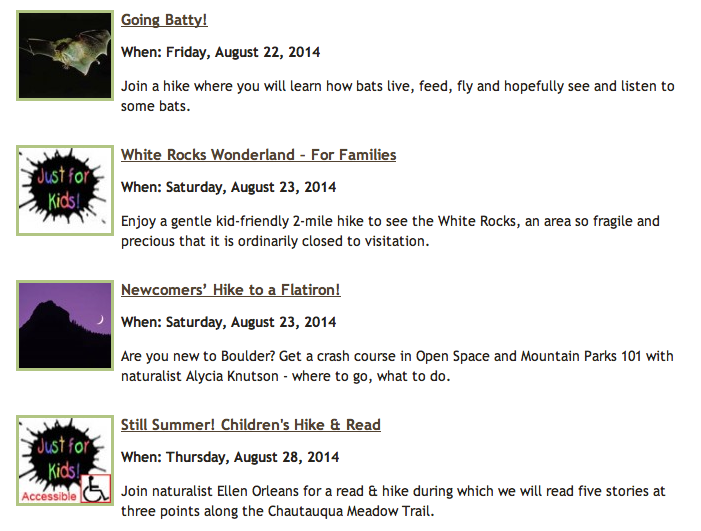 Meet mountain creatures, tell stories, make crafts, and more. 3:00 to 6:00pm. $6 advanced or $8 at the door. Great for children of all ages. Louisville’s Monster Dash. 1k kid’s race, 5k/10k adult race. Boulder High’s Kid Friendly Haunted House. They turn on the lights, turn down the scare factor and let kids enjoy a fun haunted house experience. 1:00 to 4:00pm. Bats, Spiders & Pumpkins–Halloween story time & hike. Celebrate the creepy creatures of Halloween as naturalist Ellen Orleans reads lively picture books at the Chautauqua Ranger Cottage. Kids join in the fun with foot stomping, arm-flapping, and the color of the week. 3 to 6-year-olds. Wear clothes to match the weather and bring a snack if you like. 10:00am start. Halloween at the Y. The Arapahoe Y is hosting their annual Halloween Hullabaloo. Venture into the haunted house (not for the timid), enjoy carnival games, explore the cookie forest and light up the night in our new glow-in-the-dark room. Oh, and don’t forget the bone-chilling fun of the ice rink with costumed performances from the Flatirons Figure Skating Club. Free for members and non-members. 5:30 to 7:30pm. Treasure Hunters Halloween Party at the Boulder Bookstore. Join the Boulder Bookstore for a Treasure Hunters themed Halloween party. They’ll have snacks, crafts, trivia, a pirate costume contest, and a treasure hunt! 6:30pm. Munchkin Masquerade on the Pearl Street Mall. This is the classic Boulder Halloween event for kids! Join the masses as you walk along Pearl Street stopping into businesses that happily hand out treats. Dress up. Have fun. Great for young kids. 3:00 to 6:00pm.